Why Is Running Healthy for Aging Adults? Running is one of the easiest exercises to start at any stage in life since it requires very little training or equipment. Whether your senior loved one has been running for years or just picked up the habit, he or she can gain quite a few health benefits. Harrisburg respite care experts have put together a list of some of these crucial advantages. Aging causes bones to weaken slowly over time, and even a minor fall can lead to broken bones. Running is a form of weight-bearing exercise that actually stimulates bone regrowth. 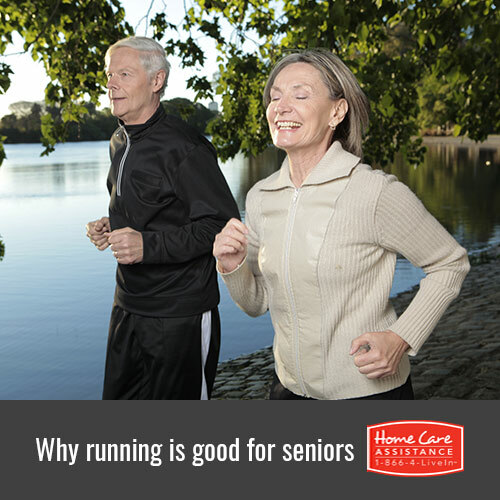 A good run combined with a diet rich in calcium is a great way to maintain bone density in the senior years. Cardiovascular exercise is critical for lowering your loved one’s risk of heart attacks and strokes. Running helps lower cholesterol and increases blood flow to the heart. In addition to increasing circulation, running sends oxygen-rich blood to every system in the body. Obesity increases your loved one’s risk of developing many serious health conditions, such as heart and respiratory disease, certain types of cancer, and diabetes. However, running can help your loved one lose or maintain his or her weight through the consistent burning of calories. Since running burns more calories than walking, your loved one can also try shorter workouts on days he or she needs a break. Constant use of joints and muscles is the best way to keep them limber. Running also builds muscle memory and body awareness, which can help your loved one prevent falls. As your loved one runs, he or she develops core muscles and enhances balance. This can help him or her retain mobility with age. Seniors who are depressed or anxious are less likely to take care of their health. Running releases endorphins, which help prevent feelings of depression and promote a positive mood. This may make your loved one more likely to attend medical appointments and take other steps toward better health. Regular exercise can help your loved one live a happy and healthy life. If he or she needs help participating in physical activity, reach out to Home Care Assistance. Our caregivers are trained to assist with exercise and mobility and can help with a wide array of other important daily tasks as well. For more information on at-home care Harrisburg seniors can rely on, call one of our experienced Care Managers at (717) 540-4663 to schedule a complimentary consultation.